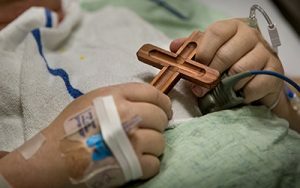 The Catholic Sacrament of Anointing of the Sick, formerly known as Last Rites or Extreme Unction, is a ritual of healing appropriate not only for physical but also for mental and spiritual sickness. Not only can one receive this Sacrament when a person is dying or seriously injured to the point of death, but it is also administered when someone is ill, up in age, is having surgery and for several other reasons. It is administered to primarily help the person get spiritually well. Before someone goes to the hospital for surgery or the like, contact one of the priests and we will gladly administer the sacrament to the person in need. If you or someone you know is in the hospital, please call the rectory to let us know. There is no to guarantee we will know, as the hospitals do not always inform us. While talking about the sick, if someone is confined to home for a period of time, please call the rectory. We can arrange for someone to bring you Communion on a regular basis. We have several Eucharistic Ministers besides the priests who will be glad to visit with you and bring Communion.